Ever have a hankering for pizza but don’t want a whole pizza, can’t figure out what toppings to pick or need individual choices for a crowd? OR need gluten-free options? 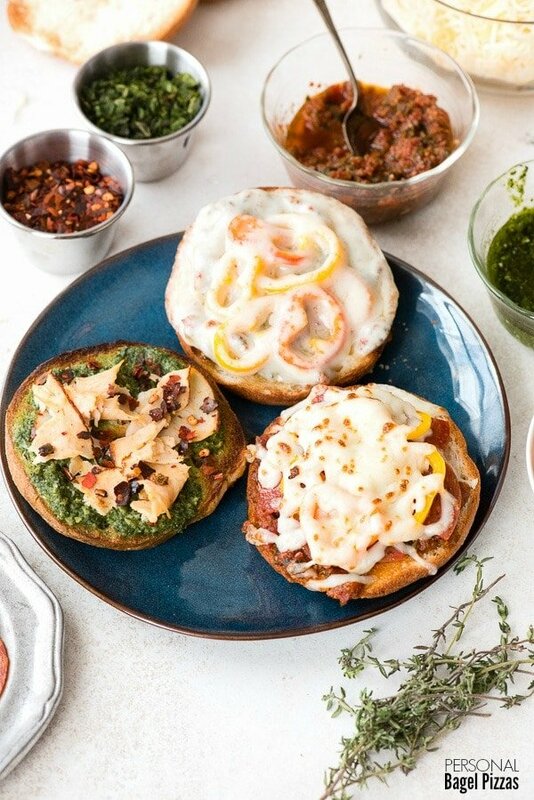 Personal Bagel Pizzas are the solution! Just the right size for one, or for a party, and the sky is the limit on what you put on them. We are big gluten-free pizza eaters in my household. Well,­ I should say, the rest of my family is. I like the taste of pizza but find my kids will each eat ­­a whole gluten-free pizza themselves. So if I want one I need to make a third one (my husband eats gluten so has his own). I generally only want a few pieces and don’t want to eat it for leftovers. On a ride to school a few weeks ago my daughter brought up the idea of making personal pizzas out of gluten-free bagels. I almost screeched the brakes right then. Such a simple idea but one that serves so many purposes. First off, a personal bagel pizza is just that, ‘personal’. It’s enough for one person who doesn’t want a whole pizza. 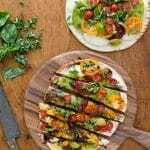 They can be made much more quickly and on the fly versus traditional frozen or from-scratch pizzas. There are no leftovers (some might find that a downside). 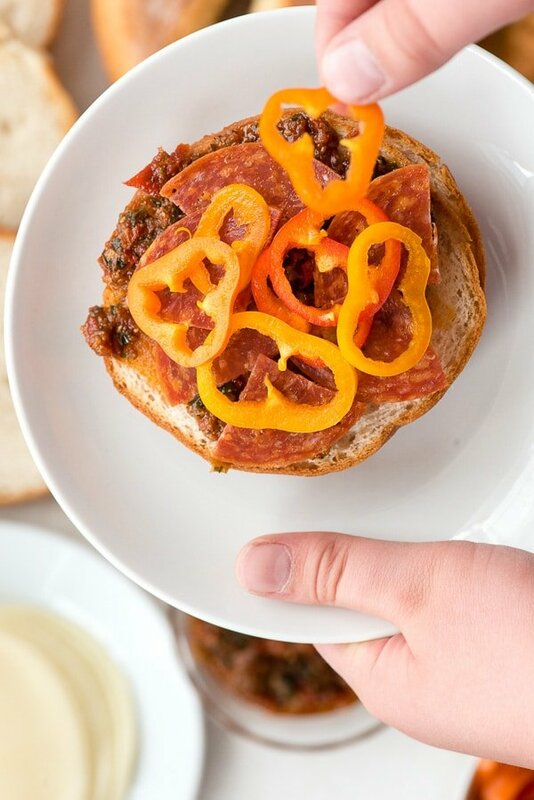 Personal Bagel Pizzas are perfect for parties. Loads of toppings can be set out and kids or adults can create their own masterpiece. For me the prospect of variety is on the top of the list. You can make two totally different bagel pizzas for the calorie cost of only one bagel. We are shifting into the high food intake time of the year. Loads of parties, outings and celebrations all laced with food and beverages, usually of the more decadent sort. I don’t know about you but I start a mental food obstacle course about right now; navigating between the events with more wholesome choices so the end result is me not gaining a ton of weight or being totally out of shape by the time January 1 hits. I started making Personal Bagel Pizzas right after the discussion with my daughter. 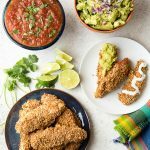 They are a great option for a fun, fast dinner. For me a half bagel ‘pizza’ is perfectly filling and satisfying. Much better than the meaty, cheesy types I’d buy from a pizza place. 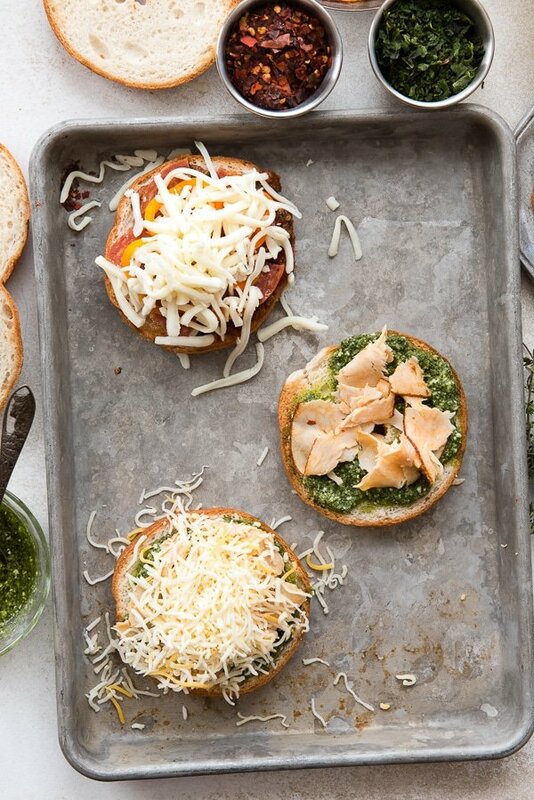 The sky is the limit with how to make a Personal Bagel Pizza. I start with Udi’s Gluten Free Plain Bagels which have a soft consistency and delicious flavor not too unlike a deep dish pizza crust. 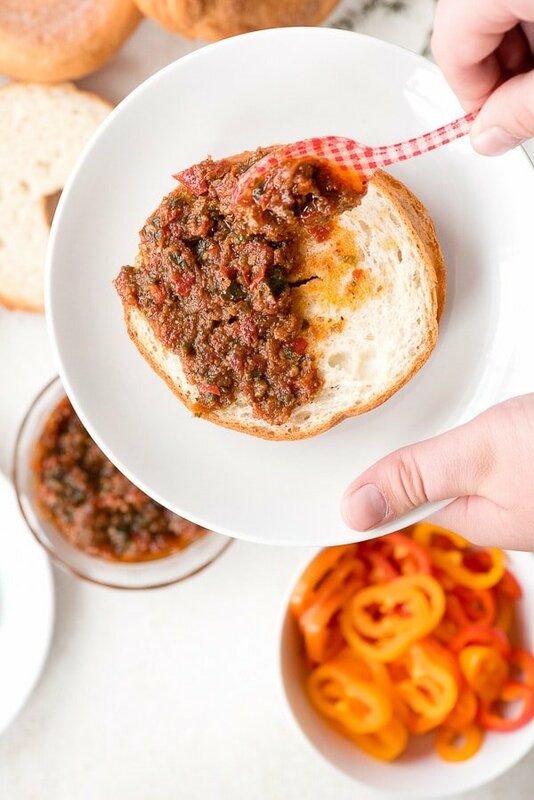 I toast them and add a sauce of some sort; marinara, traditional pesto, red pepper pesto. I then add a meat (quartered pepperoni slices, chipotle turkey slices, deli ham, shredded chicken), some vegetables or fruit (sliced mini sweet peppers, mushrooms, corn, pineapple), herbs (shredded basil, thyme, chives, red pepper flakes) and some cheese (grated or sliced). Once it’s all put together I stick it under the broiler for 15-20 seconds just for the cheese to melt. 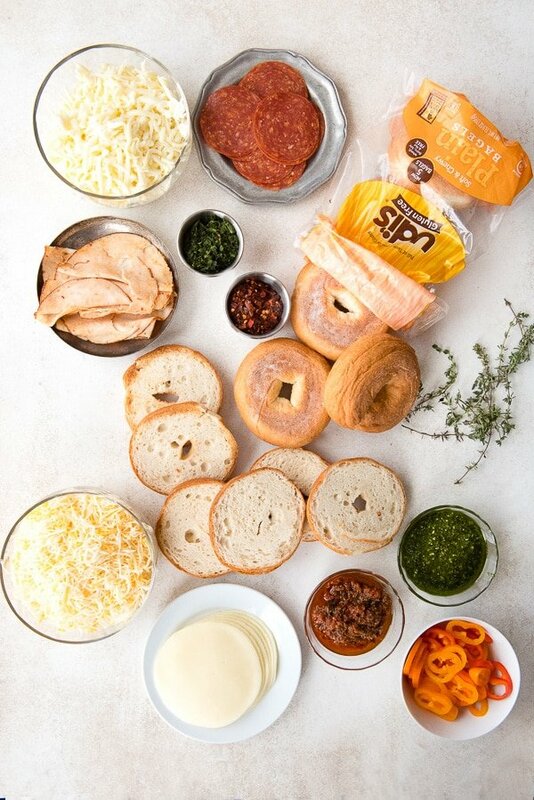 The bagel itself is a perfect consistency and the toppings are warmed with melted cheese. 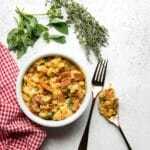 Satisfy that pizza craving with no leftovers! 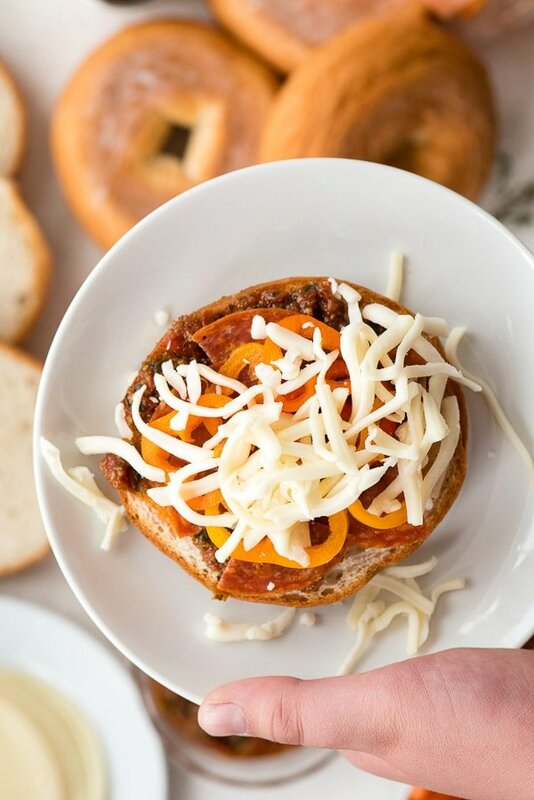 Personal Bagel Pizzas are simple to make and allow multiple options in one sitting! Preheat the broiler. Toast the bagel halves. Spread sauce evenly on the cut side of the bagel. Layer with meat, vegetables/fruit and cheese. Broil just until the cheese melts (15 seconds). What a fabulous idea! 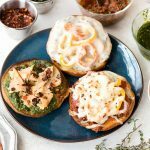 Bagel pizzas can ensure everyone has their favorite toppings, which makes them perfect for a party or a large crowd. Perfect for my son who eats pepperoni pizza way too much. 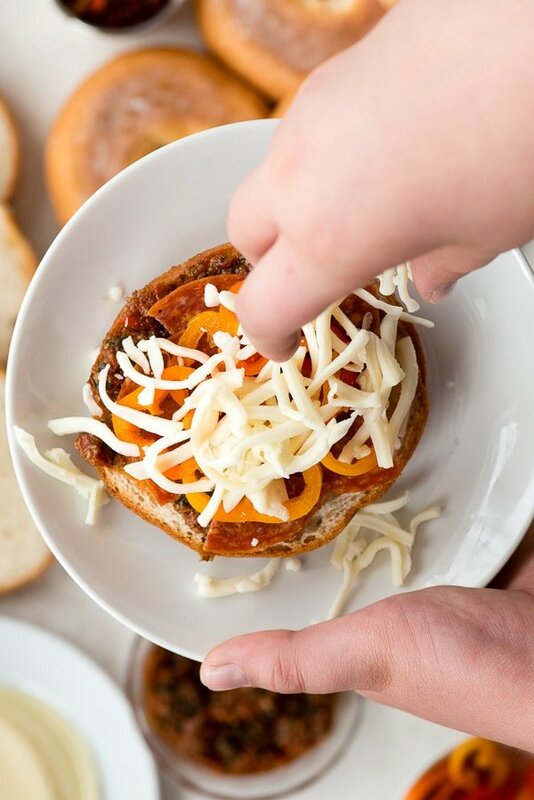 A bagel pizza would get him to try different things and and add veggies. 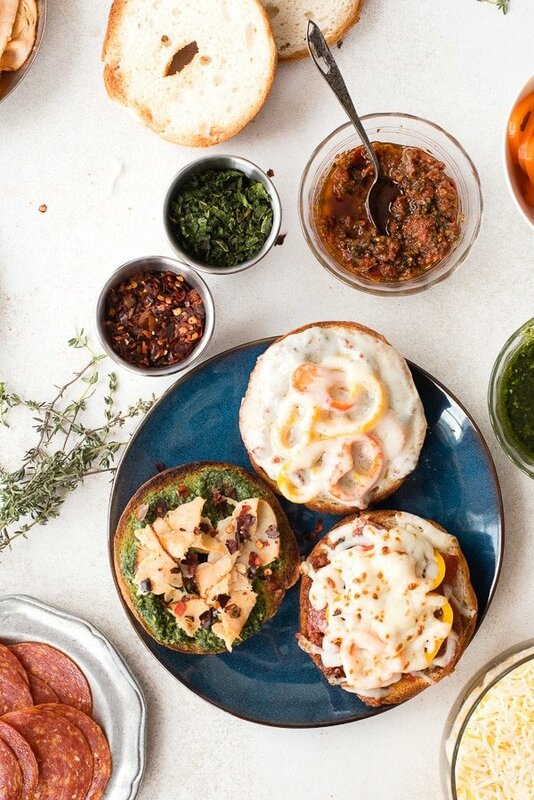 I love making personal pizza out of bagels or english muffins. So quick and easy and everyone can be happy. 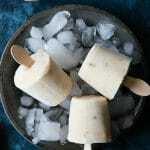 These look delicious and I am hungry. My son just picked up a bunch of bagels. I wonder what other ingredients I have on hand. Love these! The kids would definitely love the idea of making their own pizzas as well. It’s going to be a lot of fun and we can also do it before watching a movie so that we have snacks!